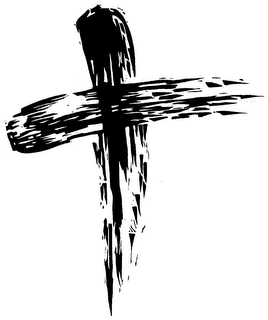 My late mother’s ashes in a box on my bookshelf remind me of Lent, which started with the traditional service and an ash cross on my forehead. I’m not saving her ashes because they are her—her soul left her body in December—but rather because snow lays thick on the ground. If I release them, they’ll smear across the landscape until the next snowfall. Given that she was a fan of everything beautiful, and I have spent the past five months honoring her wishes, I’m certain she would NOT want to be remembered as a wash of pale gray on white. So when the snow melts (in May), I’ll scatter ashes across my meadow, among spikes of the wild purple asters and mounds of the wild pink roses that she loved so well. But for now, even as in life, she’s looking over my shoulder. As I adjust to a world without her, life marches on. The woodworker continues to build my desk, my only literary indulgence (so far). 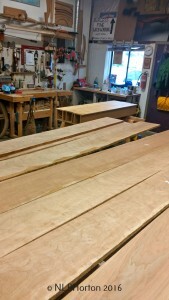 Yesterday, I stopped by to see the wood for the skirt. 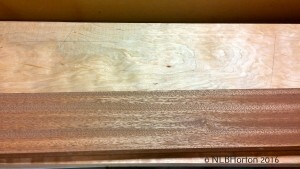 It’s Sapele from Africa. We believe it’s linear quality and deeper color will compliment the swirly and paler cherry that comprises the desk top and legs. 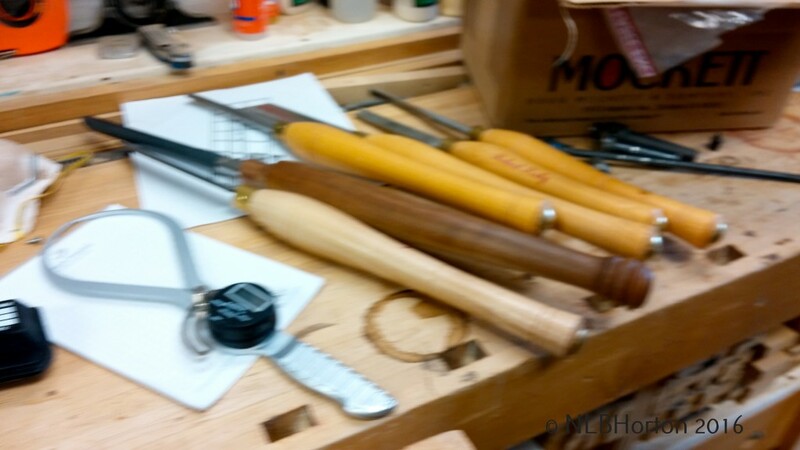 And just as I rely on a variety of tools—travel, maps, atlases, history books, articles, and other reference materials that occupy my bookshelves (with Mother)—to create manuscripts, the woodworker’s shop is a wonderland of clamps and saws and hand tools. Manuscripts and furniture also share careful planning and imagination, and a willingness to risk. My new desk is symbolic of my rise from the ashes of Mother’s death. I’ll move into the future, with new projects and stories and energy. She’ll be a part of the process as the meadow turns green, and the roses and asters bloom each summer and fall. 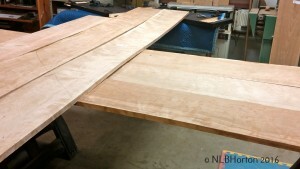 The actual, physical labor on my desk began today. 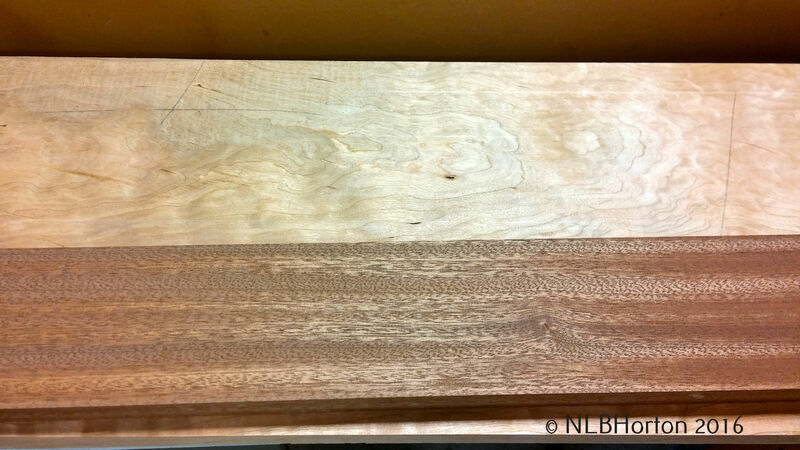 It was a joy to stop by the woodworker’s shop to prioritize the timbers and specify those I liked the most. The wood is cherry and very colorful (at this point), swirling with lavenders and greens, and chocolate veining. The colors will deepen as the wood is exposed to light, and I’m going to spend the next year clearing the desktop every evening so that my materials don’t leave permanent shadows. It’s a small price to pay for something I’ll love. We arranged the pieces, inspecting each for particularly beautiful sections. 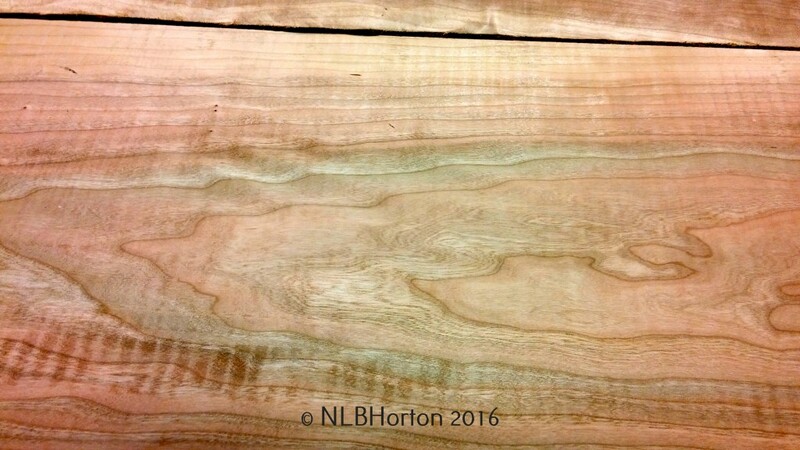 I admired heartwood and grain. We propped the pieces on their narrow edges to see how much each piece has bowed as it dried in our scant humidity. He pointed out “the center of the universe,” a spot that is dead center in the tree, with everything radiating out from there. That will be right above my keyboard, exactly where I sit when I work. He calculated lengths. Could we dodge that knot? Can he make cuts so that we can use the ends on each side of the bow? What’s the drop-off? Do we try to make the swirly grain align, or do we break it up? If the colors bounce too much, do we want to add a glaze? 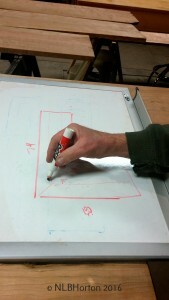 Then he drew the desk, labeling each pattern piece to match to a board. The most exciting moment was wen he laid the timbers in place so that I could confirm the dimensions. I had settled on measurements that roughly matched my arm span, but realized that I needed another six inches on the longest (right) side. International suspense is a research-heavy genre, and I’ll stack reference materials—books and articles, maps and atlases—all the way to the right edge. 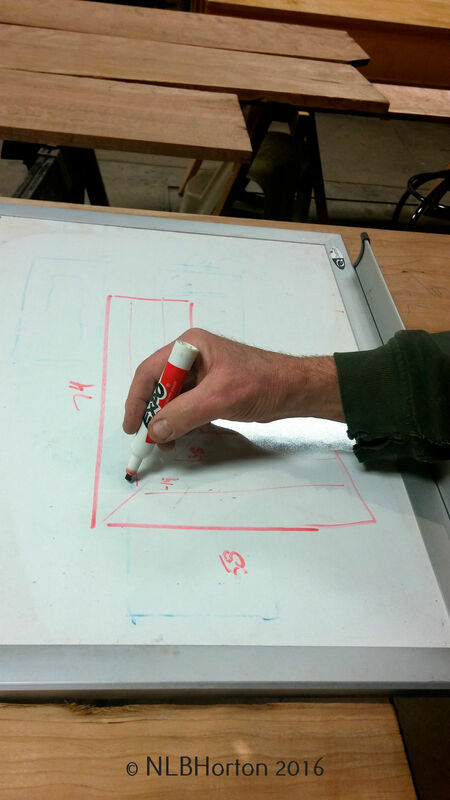 In so many ways, building this desk is like writing a manuscript. The process begins in the imagination, fueled by everyday situations, data and information that crosses my radar. Bits and pieces, characters and scenes—all need to be vetted, just like each of these timbers. Then the chosen ones must be arranged in a cohesive manner to maximize every element, again just like the timbers that are making up my desk. Then everything gets woven into a storyline, creating one solid experience that functions as intended, and hopefully inspires beyond all expectations. I’ve lost myself in the past months. Away from home more often than not, I’ve tended my dying mother. 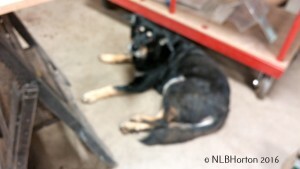 Now I help my elderly father adjust to a change that rocked his world after sixty-six years of marriage. I’ve been looking for bits and pieces of me. Living in ICU. Meeting with attorneys. Touring assisted-living centers. Taking time to breathe. Barreling back into supporting whoever needs it. I’m fortunate to be able to do this, but it’s a heavy gift to receive. Such is the path of the caregiver child. Before things got this crazy and that two-foot stack (the first of several!) 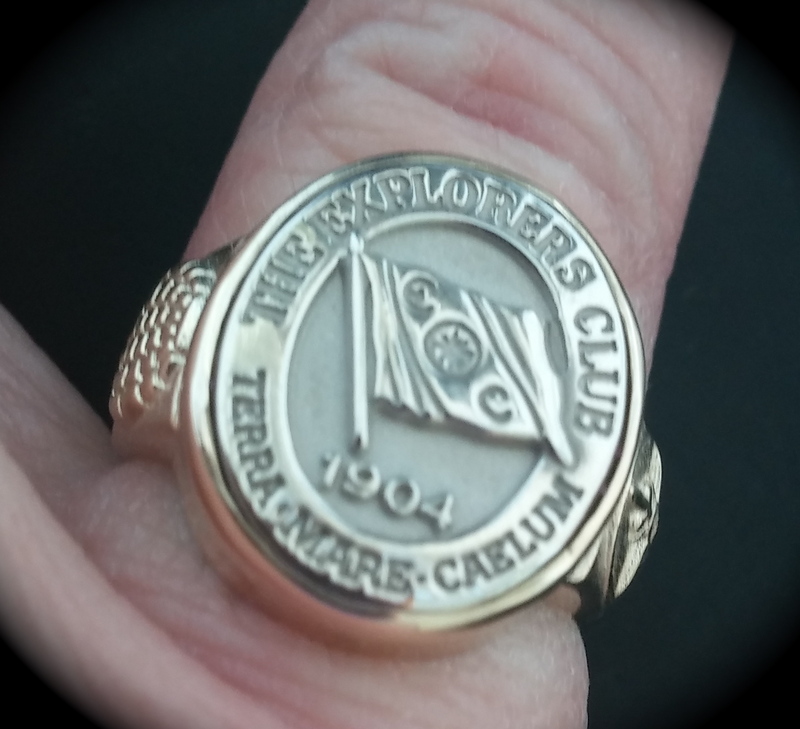 of my parents’ records, passports, accounts and ledgers landed on my desk, I ordered my ring from The Explorers Club (founded 1904). It’s my first ring from an institution, having foregone high-school and college senior rings as extravagances. The venerable band of scientists and researchers has counted Churchill, a Roosevelt or two, and Sir Edmund Hillary among its members. I am honored. I’m a late-in-life adventurer. A fairly traditional rule-follower who decided, once her children were grown, that there was a HUGE world to investigate. I received my master’s degree at fifty. Voracious childhood reading is the foundation of my wanderlust. It’s a privilege to indulge in the passion of curiosity, the urge to explore. So I dig on, through this phase as the facilitator of a family in transition. The ring is symbolic of an independent person who is more than wife, daughter, mother and friend. I’m a sum of those parts, but not defined solely by them. The globe, flag and compass on the ring signify a world beyond today, at this desk, with these onerous responsibilities. The symbols remind me of tomorrow’s journeys. Things yet to learn. Stories yet to tell. (I have so many!) People to love. Ministries to perform. Life to live. The ring also represents my mother, who encouraged me all my life to “dare to be different.” And my father, who taught me that I could be anything I worked hard enough and had the talent to become—unlimited by gender. I’m crouching at this moment on the shoulders of others whose values I carry into the future, centering myself as I prepare to stand upright. 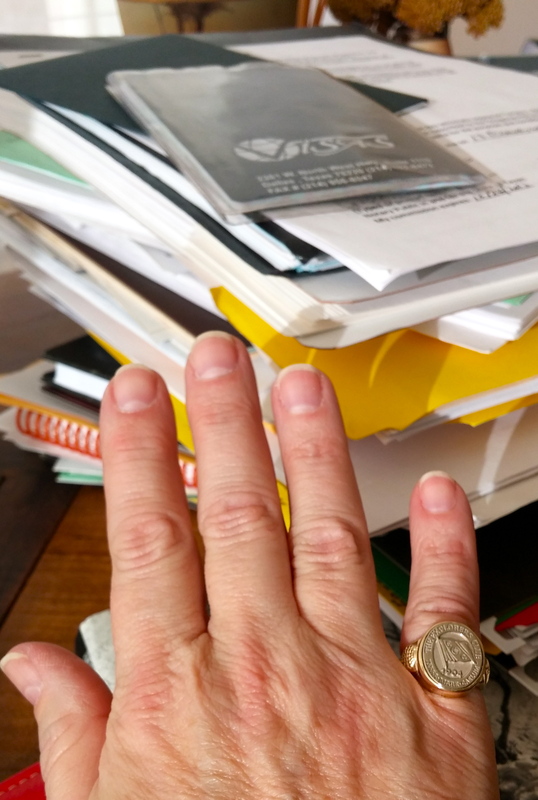 The view, which I’m just beginning to glimpse again beyond that two-foot stack of paperwork, is amazing. Thanks for being here as I regain my footing. 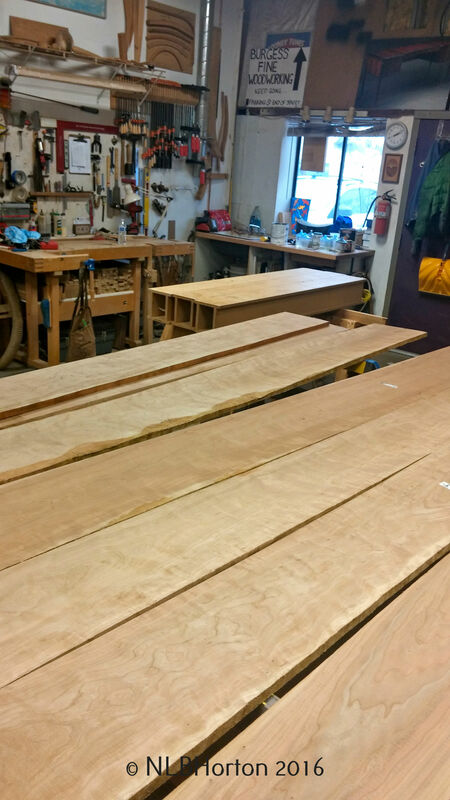 While the woodworker building my desk makes last-minute changes to another project, and in the midst of the most intense snowstorm I’ve seen in six years, I’m coping with my 87-year-old Dad in the hospital—after Mother’s death six weeks ago. The airport and pass have been closed off and on for three days. Fortunately, I’m holding a ticket out tomorrow. 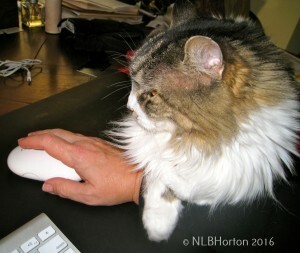 As I sit at my desk to write this blog, I realize that I have absolutely nothing to say. All my energies for the past five months have been channeled into caring for my parents. I haven’t rebuilt personal reservoirs. I’m eager, anxious and maniacally motivated to expand the long synopsis of the next book, probably because I want to immerse myself in my characters’ lives to flee my own. Escapism comes to mind. 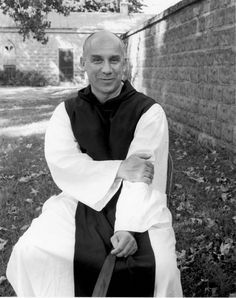 I threw myself into Thomas Merton this morning, a monk/thinker/activist who has been my port in any storm for three decades. Let me share his appreciation of silence with you.